Peatross Angel-control was a popular alternative to Fires last year, and this lady was the reason why. She's absolutely nuts in limited and in constructed, she seals the deal. A 4.5 in constructed, a 5 in limited. This card was great in block constructed, and it's solid in standard. If you're playing in limited, playing white, and you DON'T draft this card, I want to money draft you. Andrew Chapman Ahhhh, now we're talking angels. This gal saw lots of play during the Masques-Invasion type 2 days (not too long ago). She was the main kill in one of the defining decks of the time, and for some good reason. Imagine doing the second part of an Orim's Chant to your opponent every turn. Not bad, eh? Didn't think so. Boy is this card annoying. It hits you for 2 stupid points but keeps you from attacking the next turn. In its' block it was really pretty good because it was hard to kill. Now with Odyssey and Torment it dies like a dog. I remember that this stupid card kept me from a probable T* at the qualifier for US Nationals last year and I have been mad about it since then. In current constructed it is a pretty good card but there are lots better for the cost. In limited it is definitely a player. Turpish I love this card. It greatly punishes decks for being too simple-minded. If it had been a 1/1 for 2 it would've been stupendous (its ability is more important than the damage), but it's still good at 5. 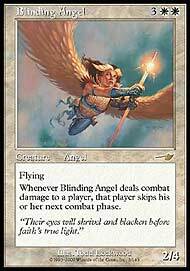 Blinding Angel served purpose in a lot of control decks. However, there were even a few creatures decks that played it just to hold off the enemy. 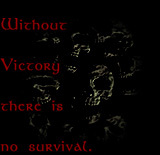 I have even seen it cause some chaos in multiplayer games. As for limited, I think I would still take it. It would definitely be in the top 2-3 picks of the pack.